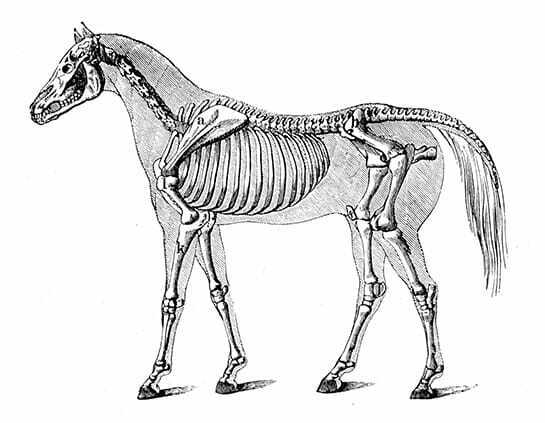 The signs and symptoms of PPID can vary depending on the level of progression of the disease and the individual horse. While the signs of advanced PPID are more obvious, it is easy to miss the subtle, early symptoms of PPID. 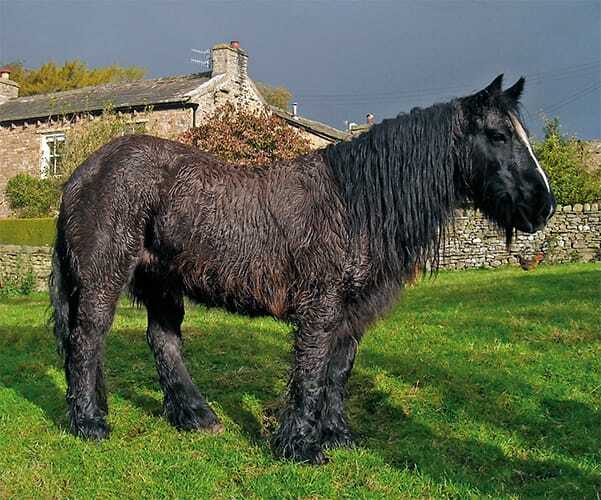 While there are many clinical signs and symptoms of PPID, abnormal hair coat and laminitis are the two most well known. Both of these symptoms can occur at all stages of the disease but tend to be subtle earlier on and increase in severity as the disease progresses. Abnormal hair coat, including a lack of seasonal shedding, is one of the classic clinical signs of equine PPID. haircoat abnormalities tend to be subtle and regional. Your horse may shed his winter coat everywhere except in small patches—usually around the jawline and base of the neck, and along the back of the front and hind legs. The summer coat may grow longer and lighter in colour in these areas. hair coat abnormalities are more noticeable and generalized; your horse does not shed out his winter coat until well into spring or summer, or in some cases, not at all. The fur may also appear abnormal—lighter in colour, longer, and/or curly. Laminitis is the inflammation of sensitive layers of tissue inside the hoof. Laminitis is considered both an early sign and an advanced sign of PPID. Laminitis can also occur in a number of situations other than PPID, including equine metabolic syndrome. Laminitis has been shown to be associated with abnormal insulin levels. Laminitis can be a devastating disease. It is extremely painful and debilitating for the horse. In severe cases, euthanasia is often the only option. Recognizing the early signs of laminitis is important to increasing the likelihood of a positive outcome. Recognizing the early clinical signs of PPID is important, as it can help lead to an earlier diagnosis of PPID. The sooner you can begin treatment, the easier it is to manage the symptoms. Increased sluggishness compared to normal could be an early sign of PPID. A change in personality can be one of the earliest equine PPID symptoms. Delayed shedding of the winter coat may occur in some areas, and the summer coat may look different in these same areas. Fat deposits may appear along the crest of the neck and at the tail head, as well as above the eyes. 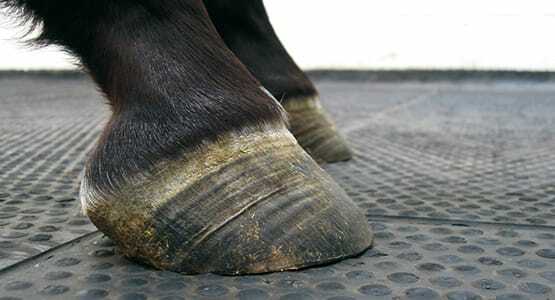 Sensitive layers of tissue inside the hoof may become inflamed. Reproductive cycles may be abnormal or absent, potentially leading to infertility. Changes observed in early PPID may be more obvious in advanced PPID. 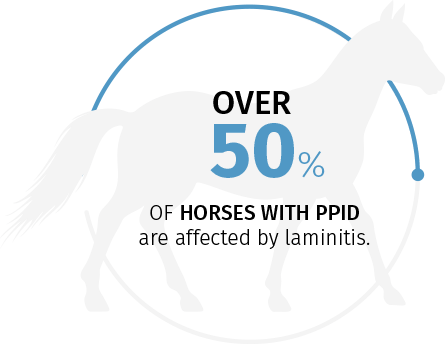 Laminitis is a sign of early and advanced equine PPID. Changes in shedding and overall appearance of the horse’s coat may become more obvious and generalized. Loss of epaxial muscle (muscles along the horse’s back) may become increasingly pronounced. The horse’s belly may become distended. Increased or decreased sweating may occur, typically on the shoulders and neck. One in three horses with PPID will experience excessive urination and thirst. A few examples are recurring secondary skin infections, hoof abscesses, conjunctivitis, and sinusitis. Blindness and other neurologic problems can develop in advanced cases of PPID. Can you identify the signs of PPID? about this often-overlooked disease by taking the quiz.